Typically picturesque, the Pueblo (meaning ‘village’ in Spanish) is perched upon a hilltop with plenty of accommodation offering amazing views over the coast. Full of white washed houses, palm trees and squares filled with fountains and orange trees, this charming location provides a quintessentially Spanish backdrop for any destination wedding. 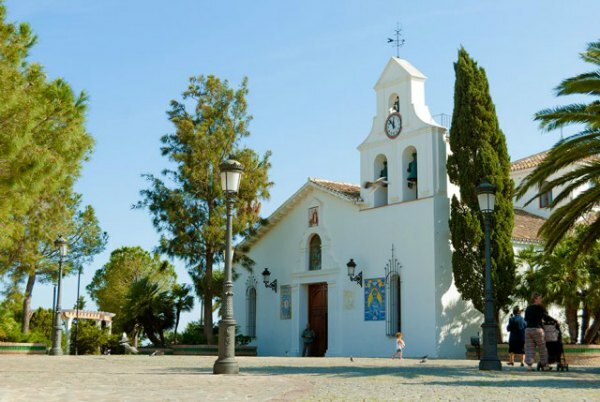 The church of Santo Domingo de Guzmán, the oldest church in the area and the original center around which the Benalmadena village was originally built, is situated in a quiet cobbled clearing surrounded by trees and sporting three large bells in its tower. It is favoured by our bridal couples for its easy access (ideal for brides opting for arrival by wedding by car or horse and cart) and its traditional Spanish architecture. Inside, the church is simply furnished and intimate, its gilded altar and simple white walls making it ideal for those wanting a low key Catholic ceremony. As you make your way south of the village towards the sea, the village of Benalmadena gives way to a livelier part of the town teeming with restaurants, hotels and stunning beaches. Benalmadena Pueblo is a tiny slice of real Spain featuring one of our best loved churches, without being too far away from the fun in the south that Spain offers by the bucket (and spade) full!